Class of 2008/09 - Where are they now? A sample of graduates who left higher education in 2008/09 were asked what they were doing on 26 November 2012. The full report of the survey results is available on the HESA website. Summary results and charts can be found in the introduction. 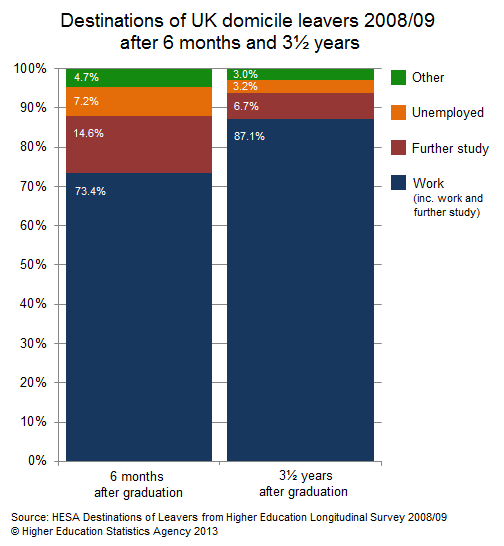 87.1% of UK domicile leavers surveyed were in employment 3½ years after graduation. 6.7% were in further study only and 3.2% were unemployed. When the same cohort were surveyed in 2010, 6 months after graduation, 73.4% were employed, 14.6% were in further study only and 7.2% were unemployed. Chart 5 and tables 5, 10 and 14 in the full report give more detailed comparisons of the early and longitudinal survey results. The longitudinal survey is carried out every two years. The latest survey shows a small increase in the proportion of UK domicile leavers employed or in further study, and a small decrease in the proportion unemployed compared to the 2010 survey of leavers from 2006/07. However the unemployment rate is still higher than it was for 2004/05 leavers when they were surveyed in 2008. The survey included qualitative questions about graduates' opinions and levels of satisfaction. 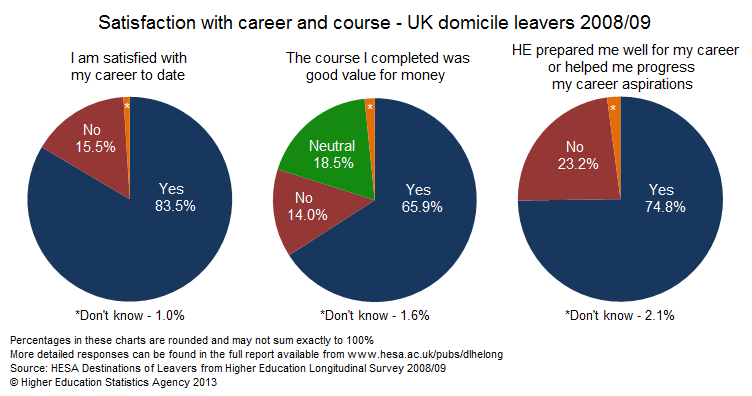 83.5% of UK domicile leavers said they were satisfied with their career to date. 74.8% thought that the course they had completed in 2008/09 had prepared them well for their career. 65.9% agreed that their course had been good value for money. The median salary of UK domicile full-time first degree leavers from 2008/09 who were in full-time paid employment was £24,000 pa after 3½ years. This compares with a median salary of £20,000 pa at the 6 month early survey. The Survey was completed by 62,205 leavers who had previously completed the Destinations of Leavers survey six months after graduating. The six month survey was completed by 354,730 leavers out of 470,940 eligible qualifiers from the 2008/09 cohort.